Improve consistency and accuracy, and lower scores by using a putting stroke on those delicate chip-n-run shots. Made of soft brass for excellent touch and feel. CHIPMASTER - Flange. Right hand only. VT 96 - Compact head design. Available right and left handed. Golfers are a unique group of individuals. They seem to think using clubs a Pro uses can also improve their own game. This may be true for most everything, except when it comes to having to hit shots that are around the green. With a legal rule of only 16 clubs allowed in the bag, they have learned to chip around the green using short lofted irons, which were intended for full swings. They modify their grip, stroke and stance position to achieve success. They make it look easy hitting those chip shots. The average golfer can spend hours and days of practice and still never succeed. They come up short; long sculled shots off the green with very little chance to get close enough for only a one putt in the hole. Being off the green but hitting in regulation all other shots except the last one landing on the green now leaves him one stroke down if he still needs two strokes to sink the putt. Matzie Golf has the solution! 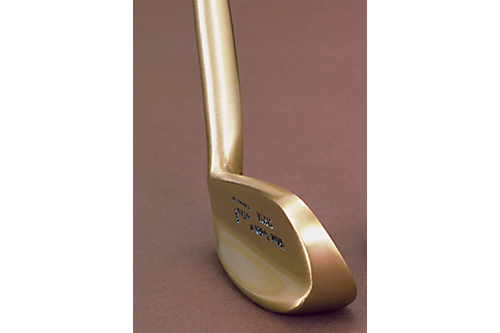 Use our Chipmaster club and the results will save you at least 7 to 8 strokes off the total round score. Our chipper was designed to allow golfers to use the same position and stroke they use in putting. The head is weighted slightly more and has an approximate 7 iron loft to the face. Since every golfer has a reasonable good result in controlling distance and placing the ball close to the hole when putting, it’s easier to use the putting stroke when chipping. The ball is gently lifted over the grass and runs to the hole leaving only a short one putt into the hole. A few chip shots, using the Matzie Chipmaster will even be holed out and now you have made a Bridie instead of a Parr for the hole.